Yes, something is wrong. But something in you won’t admit it. Yet. There’s this weird human thing we do where we hold difficult things by ourselves. We want to share them with others and feel like we’re not the only ones, but something in us resists this. Pride? Stubbornness? We want to prove we can do it by ourselves? Maybe we’re scared they won’t understand or will judge us for being weak or making a mistake. Or maybe we’re terrified of being truly seen. It feels way too vulnerable. So we walk through life holding things alone that feel way too heavy. A health concern…a worry for a child…an issue at work…a difficult relationship…an unspoken expectation…a concern for the future…a secret…an addiction…a fear. 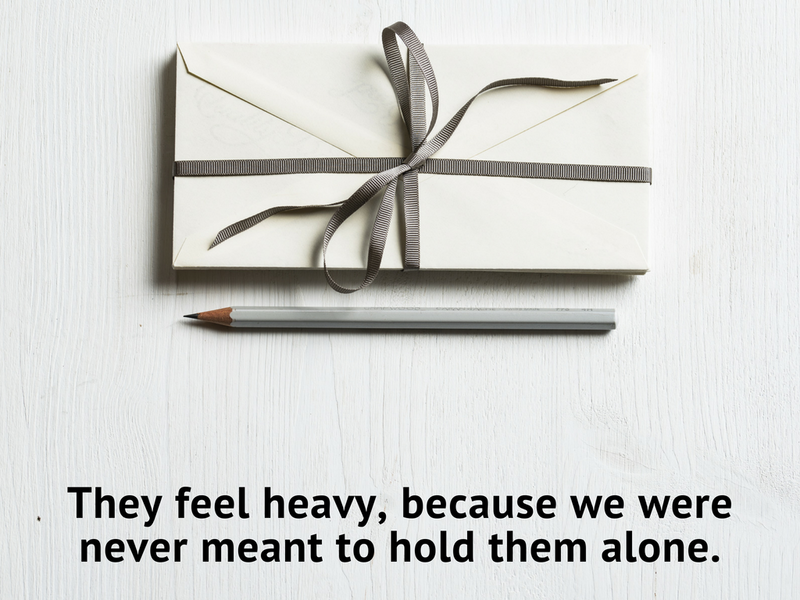 They feel heavy because we were never meant to hold them alone. Last month, I noticed how stress went down when I wasn’t working for a season. Of course…but it made me question the source of my stress. I love this work and the people. God built me to do this. Sure, there’s stress in every job and responsibility we have to some degree. But I realized my stress came from how I held the work. It felt heavy. Not because the work was hard at points. It felt heavy because of how I was holding it. I was holding it like this all depended on me. Like I was ultimately responsible for the spiritual well being of every single person connected to this faith community. Of course it felt heavy! It was something I was never meant to hold alone. One day an image came to mind of me holding a huge boulder on my back and trying to look really chill. Relaxed and calm. “I’ve got this.” This had to stop. Then I was compelled by a much better image. I saw myself standing in a big group with each of you and instead of holding boulders, we were holding the bread and juice together for our community. It felt light. Joyful. Collaborative. Full of love. And it looked like fun. 1 John 4:12 – If we love each other, God remains in us. When we realize we’ve been holding something heavy and we choose to trust someone with it, God shows up. And it feels lighter. We all could use a bit more lightness and joy in our lives. What are you carrying alone that feels too heavy? You likely have someone in your life who’s trying to help you carry it. Let them. Trust them. You’re afraid they’ll drop you. They might. Take the risk anyways. Depend on someone so they can help you carry it. On Thursday, I had a doctor’s appointment to check my thyroid. It’s been a year and the doctor wanted to keep an eye on it. This was the very office where 18 months ago, I realized my anxiety was out of control and I had to get more help. I didn’t tell hardly anyone I was going and I was a little anxious. A pastor friend texted me with a question and I responded. Then I added, “Hey can you say a prayer for me this morning? I’m at a doctor’s office and feel really nervous.” She responded with a beautiful two sentence blessing that brought tears to my eyes. This heavy thing I’d been holding felt a lot lighter. This past spring, the leaders of a clothing ministry at my church took an honest look at how the ministry was going. Did they have enough volunteers to keep serving kids around the county who needed clothing? Instead of scaling back appointments, they put together a Sunday in June to tell the story of this ministry so that more of us could be a part of it. Since then, six new volunteers have said, “I can help.” The thing that felt heavy feels a lot lighter. A three year old in our faith community had cancer last year. She has scans this Thursday and the last ones had some concerns. Her mom is super woman and will try to carry this by herself at times. Will we let her? No way. Could you invite someone to hold it with you? Would God want to hold it with you? Lately when I feel the heaviness come, I pause, smile and say, “I don’t hold anything alone,” and the heaviness lifts. If we love each other, God remains in us. This is what it means to be the church. We’re never alone.